Thomas Jefferson wrote reams of good advice, important political philosophy, the Declaration of Independence, and many other things (which is why we know so much about him). To some of his younger relations he sent his favorite “Rules of Conduct” to help the people he cared for better and more insightful humans. These thoughts evolved over time so versions vary slightly depending upon the source. 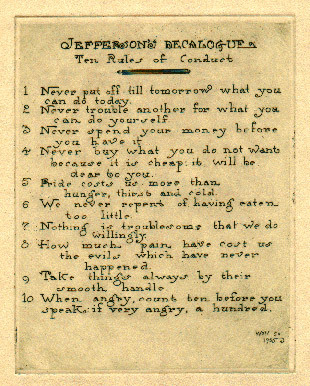 Here is a facsimile of the ten point “rules” with a slightly different version spelled out below. Never put off to tomorrow what you can do to-day. Never trouble another with what you can do yourself. Never spend your money before you have it. Never buy a thing you do not want, because it is cheap, it will be dear to you. Take care of your cents: Dollars will take care of themselves. Pride costs us more than hunger, thirst and cold. We never repent of having eat too little. Nothing is troublesome that one does willingly. How much pain have cost us the evils which have never happened. Take things always by their smooth handle. Think as you please, and so let others, and you will have no disputes. When angry, count 10 before you speak; if very angry, 100. 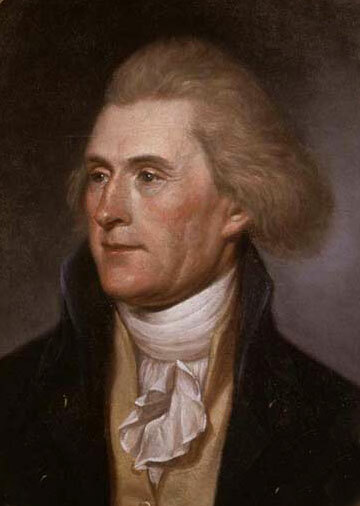 Portrait of Thomas Jefferson by Charles Peale, 1791. Despite some obvious flaws that glare in the light historic hindsight, Jefferson was steeped in classical philosophy and was a great thinker in his own right. If we all could live by these rules the world would be a better place. From 8. to 10. o’clock practise music. From 10. to 1. dance one day and draw another. From 1. to 2. draw on the day you dance, and write a letter next day. From 3. to 4. read French. From 4. to 5. exercise yourself in music. From 5. till bedtime, read English, write, &c.
He was known, like most of us, as a far-from-perfect father but his advice was sound. Three hours of music per day, be good to all living creatures, draw, dance, and read. Obviously, this advice applies to the wealthy and elite who do not toil all day but even in the modern world there are worse ways to spend an idle day. It sounds like a wise path. The Vardo: Finishing and fitting out. The bench’s small size will allow it to pack easily into the truck, even holding items in the tills. The small rucksack with the portmanteau attached. The author with his antler-fork walking stick and his dog begging for a walk. Tools, clockwise from lower left: large awl, sewing awl, rivercane needle case, bone toothpick, sewing needles in center. My personal favorite (at the moment). Low-resolution selfie from a morning hike. And I added a leather thong. Willow pack basket I made several years ago. The straps were obviously new then. Or just click the image to get to the gallery. Dopp kit and some leather working tools I use to create items like this. The little table has many miles on it now and doesn’t look this pretty at all. I’m actually in the midst of refinishing it and will post pictures sometime soon. Design was kept as short as possible for transport. The cross bolt where the arm hinges is a salvaged bolt from an old truck spare tire holder. Elk leg sinews dried and ready for processing. Replicated woven sandals from the Southern High Plains and the greater Southwest. Produced from narrow-leaf yucca. An overview of traveling gear. I see this format on the web a lot so I’m stealing the style from far batter photographers than I.
Treadle lathe turned bowl and plate made by Mick Robins in spaleted alder (I think). The spoon is Osage orange carved by me. Argh! A moment of distraction means the snap of a stone bit! The holdfasts in place, holding nothing in particular. Flame maple neck, walnut rim. My Portmanteau. 18th Century style, it has become my favorite overnight bag. A little walnut oil brings out the grain.